OUTSTANDING ACHIEVER: Wollongbar Tafe teacher and Kingscliff resident Jenny Kenny. A FAR North Coast Surf Lifesaving Official is the toast of the town after winning a prestigious State-wide award. 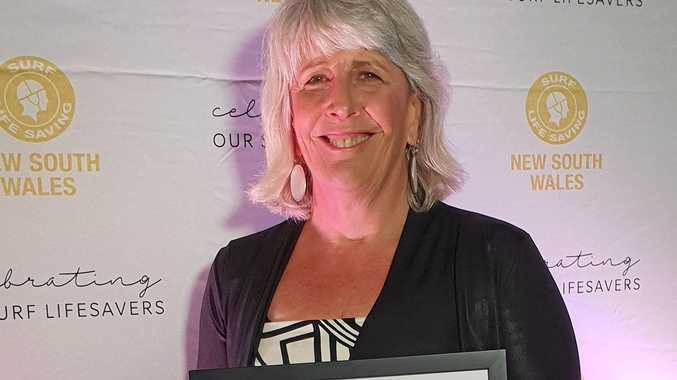 Wollongbar TAFE teacher and Kingscliff resident Jenny Kenny has been acknowledged for her outstanding dedication and professionalism by being crowned Surf Lifesaving NSW Official of the Year at the Awards of Excellence in Sydney late last month. Some of the roles she performed this season include Chief Judge, Open Male Area Referee, Deputy Carnival Referee and Carnival Referee at Branch, State (both the NSW and QLD) and National Championships. Arguably her season highlight was becoming the first woman to be appointed as referee of the Australian Interstate Championships in South Australia earlier this year. And while the award highlights a stellar year (and puts her in the running for the Australian SLSC to be named in October) it is really the culmination of a long involvement in Surf Life Saving. "I've been involved in the Cudgen Headland Club for five years after moving here from Hobart - I was already involved in Surf Lifesaving, I joined in 1980 when I got my bronze and so I've been officiating for 30-32 years," she explained. "When I came here, it's very similar to everywhere - the first year nobody really knows you. I was doing things at an Australian level and at the NSW and Queensland Titles but nobody much knew me in the club. And gradually they get to know you and you start to do things at local carnivals as well. It all went from there really. "It's sort of a backway to come into a club really." Jenny is currently second in charge of the Australian Youth Championships - something she's been doing for four years. At the Australian titles she runs all of the women's races. Jenny said even at 61 she is still loving being involved in Surf Lifesaving and is going back to active patrolling this year after a short break due to a back injury. "I started off in swimming and then waterpolo," she said. "The surf life saving club in Hobart had a water polo team and we playing water polo for them an then I was invited to come along and do my bronze. It was the first year women were allowed to do their bronze medallion post-war. I did it down there in 1980. Up here, it was interesting, this club was the second last in New South Wales to allow women in - they couldn't do their bronze here until 1989. "I have been involved in it all that time." In addition to her achievements as an active official, Jenny plays a key role as a mentor, and has provided advice and feedback on developing a senior official's course.